BERKELEY - Two decades ago, when University of California, Berkeley physicist Charles Townes and his colleagues, including post-doc Reinhard Genzel, claimed to have evidence for a massive black hole at the center of the Milky Way, few believed them. Not that astronomers hadn't long suspected a black hole at the center of most galaxies, including our own, that had formed from the collapse of many stars into a mass so compact that not even light could escape its gravitational tug. But the evidence, Genzel now says, wasn't convincing enough for most of their colleagues. Now, it turns out, Townes and Genzel were right. Last week, Genzel and colleagues at the Max Planck Institute for Extraterrestrial Physics in Germany reported in Nature nearly incontrovertible evidence that our galaxy indeed has a massive compact object at its core — a black hole. The evidence "makes it very difficult for anyone to say it's not a black hole, and the doubters will now have to give up their doubts," Townes told the San Francisco Chronicle last week. "The case for a black hole at the center of our galaxy was already very strong, mostly through Reinhard's previous work," added black-hole modeler Eliot Quataert, assistant professor of astronomy at UC Berkeley, in a recent interview with UC Berkeley Media Relations. "This just makes it closer to being airtight. There's no reasonable alternative interpretation to what's going on in the galactic center." Genzel, now a director of the Max-Planck Institute for Extraterrestrial Physics near Munich, Germany, who spends part of his time as a physics professor at UC Berkeley, has tracked for the past 10 1/2 years a star that orbits in a highly eccentric, comet-like path around the center of the galaxy, which is located in the constellation Sagittarius. His hope has been that, by charting the exact path of this star, called S2, he could deduce the mass of the object it orbits. Orbit of star S2 around the black hole at the center of the galaxy as mapped by Reinhard Genzel and his colleagues at the Max-Planck Institute for Extraterrestrial Physics. Today, he and his colleagues have observed about 2/3 of the star's entire 15.2-year orbit, and calculate that the galactic core has the mass of some 3 million stars like our sun, all tightly packed into a region less than the size of our solar system. Stars buzz "like a swarm of flies" around the center of the galaxy, Genzel said in a phone interview from Germany, but few have short enough periods to track in a few years' time. And only recently, with the advent of adaptive optics, have astronomers been able to pick out individual stars in this tight cluster. Adaptive optics is a technique to remove the twinkle from stars, by flexing segmented mirrors fast enough to stabilize and focus the bouncing image created by turbulent air in the atmosphere. Using new adaptive optics on the European Southern Observatory's Very Large Telescope (VLT), located in the high-elevation Atacama Desert of Chile, Genzel and his team were able to get the resolution needed to follow S2. The key to their recent success, however, was a chance observation this spring of S2 as it swung through the part of its orbit closest to the galactic center. Genzel's team measured a velocity of 5,000 kilometers per second — 170 times faster than the Earth orbits the sun. With a newly installed wide-angle near-infrared camera on the VLT, they captured images of S2 with other radio sources nearby, allowing the researchers to pinpoint the exact location of S2 relative to the radio source, Sagittarius A*, long suspected as the black hole at the center of the galaxy. Sagittarius A*, or SgrA*, is a bright spot of radio waves and X-rays that astronomers see when they look at the galactic core. "We could actually nail down the position of the suspected culprit, the radio source SgrA*, on the infrared images. So we can say, during the time the star was moving fast, it was also very, very close — three times the size of Pluto's orbit in our solar system — to that radio source," Genzel said. "That's why we now know that not only is there a mass there, that mass actually is identical with that radio source, as expected." With S2 orbiting so close to a mass so large, the central object could only be a black hole, Genzel and his team concluded. Other proposed objects at the center, such as a cluster of neutron stars or smaller black holes, would not fit within such a confined area. Theoretically, a black hole is a singularity in spacetime, a mathematically precise point into which all the mass has been squeezed. This singularity can never be seen, however, because it is surrounded by a spherical region into which all infalling matter disappears and from which nothing, not even light, escapes. This "horizon" is located at the so-called Schwarzschild radius, which for a 3 million solar mass black hole sitting where our sun is, would extend about one tenth the distance to the Earth, Genzel said. The star S2 approached within 2,000 Schwarzschild radii of the galaxy's central black hole. Genzel said that some 20-30 other stars orbit closer to the galactic core than S2, some of which no doubt pass even closer to the Schwarzschild radius. With techniques like stellar infrared interferometry, which should become available within five years, it would be possible to follow the orbits of these stars and perhaps see weird gravitational effects from the nearby black hole horizon. "If we could see a star get as close as10-15 Schwarzschild radii, that would be in the region of strong gravity, so then you could test some extra things that are predicted by general relativity," Genzel said. "These stars would have velocities not 5-8,000 km/sec, but 30,000 km/sec." The star S2, though continually bombarded by X-rays emitted by gas streaming into the black hole, is sufficiently far away that it probably doesn't even know it's orbiting a black hole, he said. Townes, Genzel and their colleagues were the first to estimate the mass of the black hole at the galactic core. Based on infrared tracking of the motion of ionized hydrogen gas clouds around the galactic core, they calculated that the black hole contained about 4 million solar masses, not far from Genzel's new estimate of 3 million solar masses. 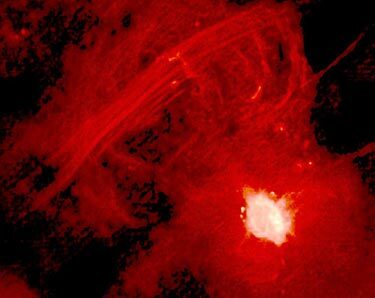 But many objected, saying that the amount of radiation emitted by the radio source Sagittarius A* was 10,000 to 100,000 times less than expected from a black hole at the center of the Milky Way. Since then, Quataert said, astrophysicists have come to realize that gas flowing toward a black hole actually has a hard time hitting it. Rather than streaming through the horizon and growing the hole, much of it is swirled around and thrown out in the form of jets. His analogy is water draining out of a bathtub, but instead of swirling down the drain, it shoots out of the tub. Quataert models black hole dynamics, including the inflow of gas, to better understand radiation from black holes. Now that the identity of the object at the center of the galaxy is nearly certain, Genzel is eager to explore the other data he has on the star cluster at the core. "This a real fantastic laboratory at the galactic center to understand how a nuclear star cluster comes about, how new stars are being formed in an environment where there shouldn't be any new stars," he said. In these studies, he acknowledges a friendly rivalry with UCLA astronomers, who have unpublished data supporting Genzel's new results. With evident pride in his former student, Townes said, "Genzel's group did it first and best. There's no doubt about that."